Advent is coming up quick and I’m already starting to think through which of our favorite ideas we will make happen this year. 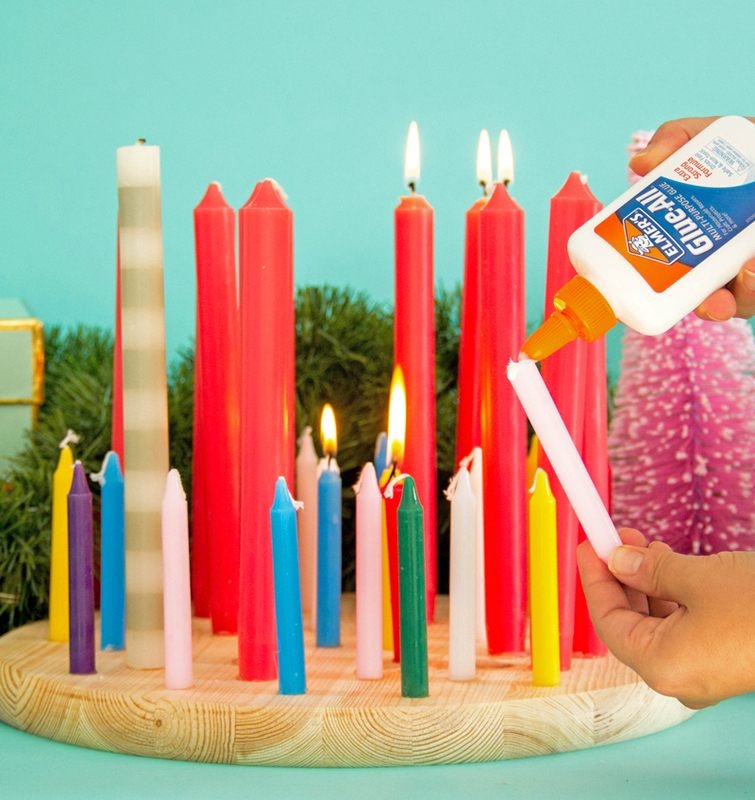 I’ve teamed up with Elmer’s Glue to make this Colorful Advent Wreath Candles. 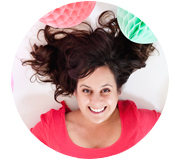 It’s bright, bold lines are an awesome way to bring a design punch to this year’s decorations. One tradition I adore is sitting down each Sunday night to light the Advent candles. We keep a candle wreath on the dining table all season long. It’s a great reminder of the brightness of the Christmas season. 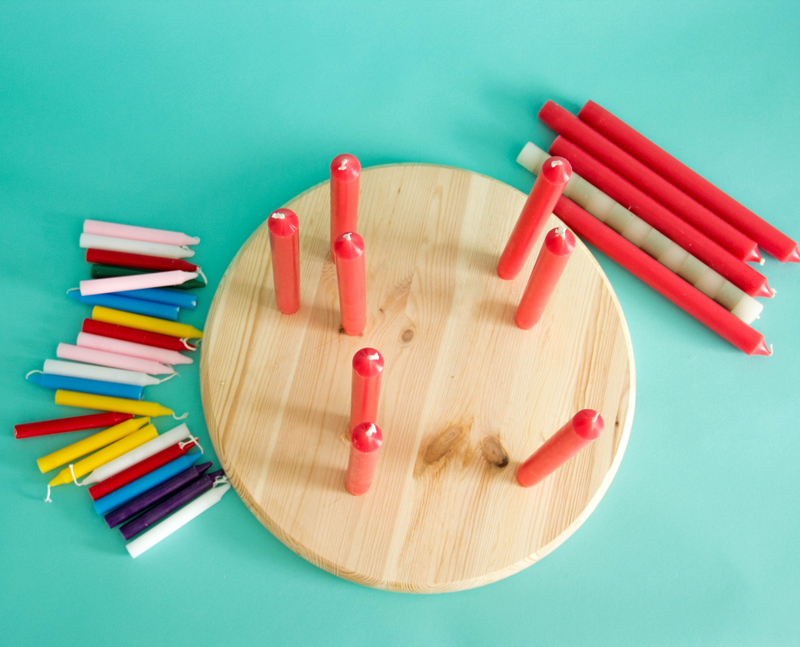 Let’s make one, DIY style with loads of color and fun. 1. To create this Advent Wreath Candles you will need to start with the long taper candles and position them in the center of the wood. We used Elmer’s hot glue for the taper candles since they are heaviest. I’ve used a lot of hot glue in my life and the new heating element that takes away those awful hot glue strings that is in Elmer’s brand makes a project like this so much easier! 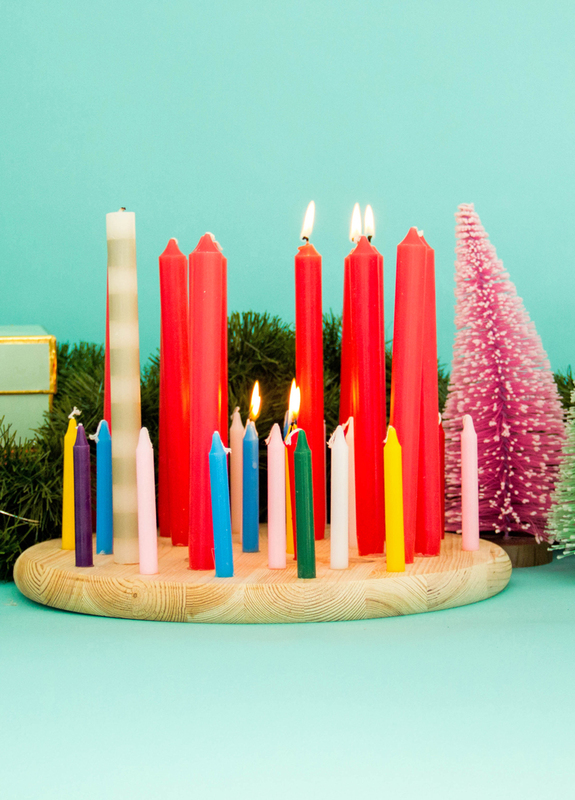 What are the best advent wreath candles? I like to do a variation of candle sizes and styles on our wreaths. My favorite small ones are right here and for the larger tapers, these are the best! The candles can be arranged in any way you’d like. I did 4 groupings of three candles each, with one grouping having the striped taper for the Christmas candle, as a traditional wreath would have. 2. Fill in the rest of the candle wreath with the smaller bright candles. These can be adhered using Elmer’s all-purpose glue onto the wood. Just glue the bottom and hold it in place for a minute while it sets. 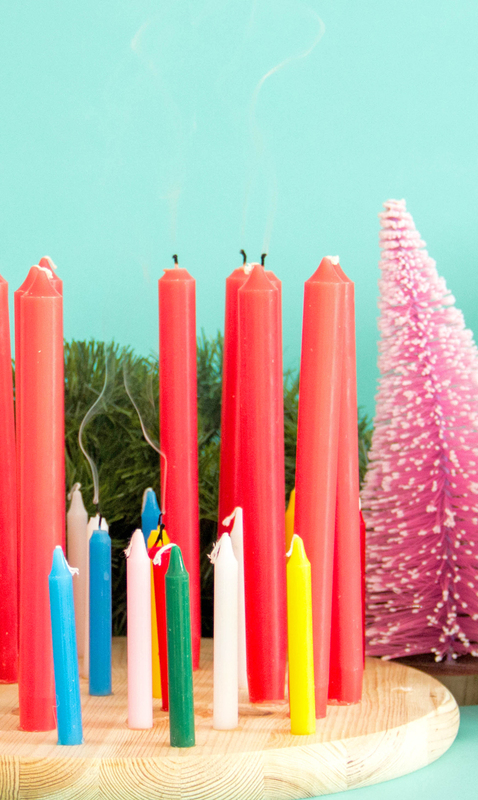 Once they have dried, set up your Advent wreath candles and enjoy them all season long! Crafting around the holidays can get out of hand, quickly! I love that this wreath is a simple statement, it can be made in under an hour and our family can enjoy it all season long. 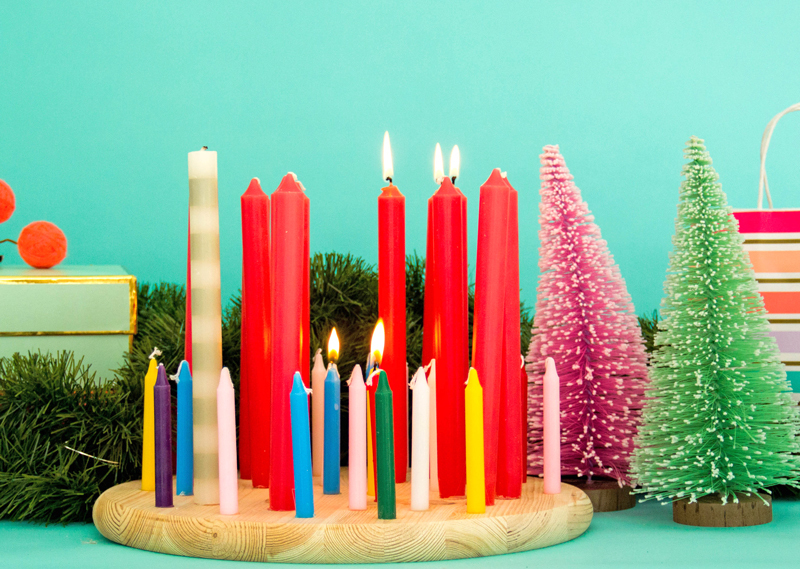 The advent countdown fun doesn’t end here, we have other festive DIYs for you! Here are a few of our advent favorites for you to enjoy! 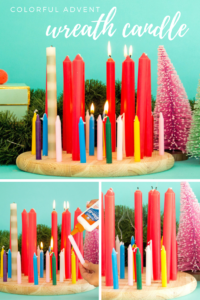 So, gather up the family create this fun and colorful advent wreath candles. I love creating lasting memories with my family and one of our favorites is creating projects that we can enjoy for the years to come. These colorful advent wreath candles are one of my favorite projects to do, but being with my family during the holiday season is what truly matters to me. Let us know in the comments what your favorite advent family tradition is with your family!